The Traffic School Providers listed below have been approved by the Department of Highway Safety and Motor Vehicles to offer the Basic Driver Improvement course, the Advanced Driver Improvement course, and the Drug and Alcohol course for First Time Drivers. Metro Traffic School is approved by the State of Florida and the Department of Highway Safety & Motor Vehicles to offer a variety of programs, such as the First Time Driver (Drug and Alcohol course), DMV Permit Test, Behind the Wheel Training (Driving Lessons), Traffic School courses for traffic tickets and suspended driver’s licenses, and lastly Driving Under the Influence (DUI). 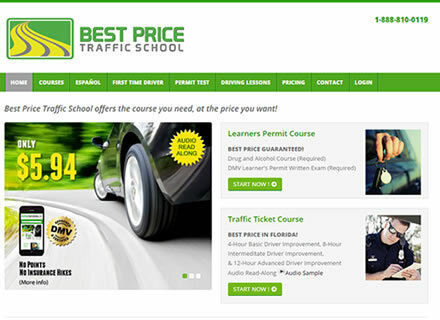 Take advantage of the most affordable online traffic school. These online traffic school programs are not only the best priced, they are also easy and convenient. Whether you are a first-time driver seeking a driving permit, or a driver who does not want their insurance rates to increase as a result of a traffic ticket, Best Price Traffic School is the perfect choice.